Priced at a $118 rate, UNIF's Twerk Jeans revive the distressed denim looks of the 90s. The trousers are purposely ripped, revealing open knees and a large rip just under one's back pocket. These ripped and frayed jeans feature an oversized look and will appeal to vintage fashion fans. Made from 100% cotton, the trousers will appeal to the daring fashion lover and feature a 90s-inspired high-waisted fit. 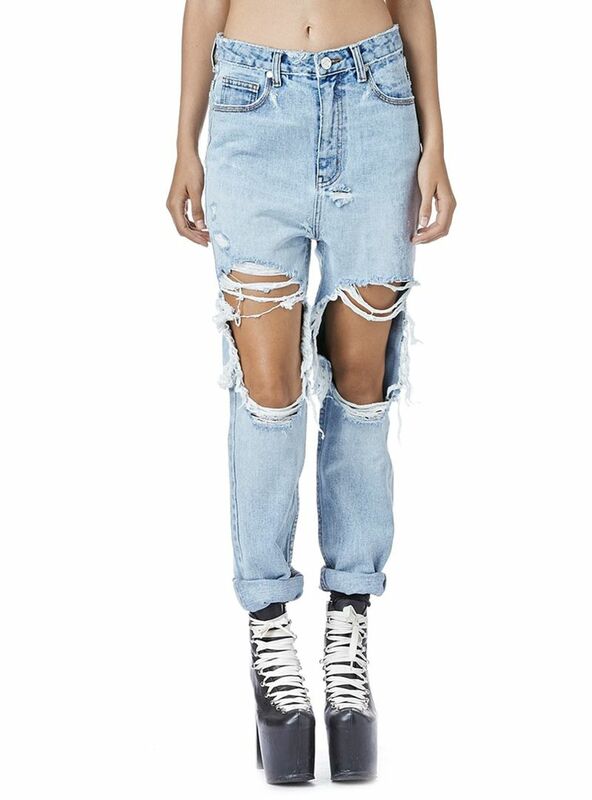 UNIF's distressed denim revival is inspired by 90s grunge styles. While many of us grew up destroying our jeans ourselves, clothing retailers are embracing this nostalgic fad and creating their own version of purposely damaged styles. Displayed in a light wash, this distressed denim garment is perfect for carefree summer days that call for an edgy outfit.